You might need GEM (Green engineering menu) activated and use User Defined Mode and manually select all that is under AUDI_MMI3G_ECE if it's not selected. So if there is someone willing to try it just let me know. 1. Unzip it on the SD card. 2. Put the sd card in the MMI. 3. When prompted press the center knob. 4. After the script is done you will see confirmation screen. Do not use MAC to unpack and/or copy the files to the SD card. Unable to do anything else, even the Reset procedure didn't work! This is a file corruption error, the MMI didn't like what it found on the SD card. As stated previously, even a MMI reset procedure didn't allow me to get out of the error. So I went to my neighbour's Windows PC, reformatted the SD card and extracted the RAR archive onto it. LESSONS LEARNED - NEVER USE MAC OS (or Unix, Linux based OS) for unpack and copy map or firmware data into SD card. Also always format SD card in Windows OS. USE ONLY WINDOWS FOR UNPACK/COPY!!! I had to upgrade Firmware as well. I could not load map data even they were copied in windows. It means that also Firmware was corrupted. (Imagine that FPGA or EEPROM is burned with some hidden apple .bin file....). Here are some of the questions raised by the forum members about the update process that I might failed to explain in the manual. Q. Do i need VCDS to do the update? A. No, you need VCDS only to clear some errors after the update but the MMI will function correctly even if you don’t clear them out. Q. I have a Bang & Olufsen sound system not a Bose. Does this also mean that i need to exclude it? A. Yes, better not to update the DSP system. Q. Currently no updates for North America? Q. I have mmi 3gp , version p0XXX can i go straight to k0900? Q. Have found the activation script and it includes "2380_00040009.fsc". This should be changed according to manual Page 31 to the MAC address specifically to my MMI or should I continue to use the "2380_00040009.fsc" as stated in the manual page 18. A. Leave the filename as it is now. Q. The 2380_00040009.fsc file contains a VIN number. Should that be changed to my VIN number? A. No, do not attempt the edit the fsc file. Q. Only thing is that my Google Maps option is greyed out... any hints? A. Reinstall the GEMMI_nav component from the K0900. Q. What does the new firmware bring in terms of added functionality? A. Not much, apart from K0770/K0767 fixing the issues with the SIM data connection and Bluetooth usage at the same time. Q. What are 03276 and 03175, will they affect the MMI in anyway and how can they be avoided? A. 03276 - Please Check Software Version Management will appear every time when the software is updated w/o VAS connection to the VW/Audi servers. 03175 - Invalid Data Set will appear when updating the map w/o deleting it first. Sometimes this helps to avoid that error. They will not affect the functionality or the sound characteristics of the MMI. Q. Is there a way to use used defined mode w/o "Green Menu"? the you will be able to use the user mode w/o the green menu. Warning - At no stage I take responsibility of your actions or any of my notes that may mislead you. Therefore, and like my all other documents I say “use at your own risk”. lukjod, soundwave, paradyne and 35 others like this. Hey guys, I just got myself an Audi A5 Sportback from 2013. I checked and I believe this is still running the MMI firmware and maps from then as well. I believe this is the right topic for my version, however can anyone confirm this and the best way to get to this latest version? As this is the first time for me doing this and I only just got the car, I don't have the VCDS cable or software yet. From what I read it will take a long time to actually install the maps and firmwares, which means either the car will be running for a long time, or I'd need to get a charger for the battery to ensure it doesn't run out. Which leads me to the next question.. Buying a cable with the software (a proper one and not a knock-off with grey area software) and either buying a charger or running the car the whole day, why shouldnt I just get this done at a dealer/garage? As I've never done a thing like this, I would like to get to know more about it as I am interested, but currently it looks like there are a lot of additional costs involved no matter which way I get the latest maps. Well, you don't have VCDS cable and you have never done such kind of things I will suggest to you two options. Either find someone local to you that have experience in this area or go to the dealer. The manual in this topic is complete and tested many times but to be honest there is always room for error. Is it the right way to do it using the info found here .... well define "right". It is illegal if you ask Audi. I meant right more in a money and time spending way. I was thinking about finding someone local as well. So I'll probably pop in a post in the UK forum part to see if there is anyone nearby enough. congo and rpacho like this. Anyone in the Netherlands that has experience with this? I want to upgrade my 2014 Audi A5 Sportback MMI but have never done it before and don't want to brick my unit. are you sure you have a MMI 3G and not a MMI 3G+ ?? I ask this, as you car is 2014.
show us yr version info. is it HNav or HN+ ?? Not sure how to tell if it is a MMI 3G or MMI 3G+. 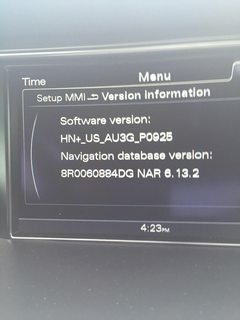 But I think a MMI 3G+ since I have Audi Connect with Google Maps too. According to the MMI info it is a HN+, see attached image. which means you can't do the activation by yourself. This means I have to use Keldo's activator for example? So to upgrade my MMI I have to first upgrade the firmware, then upgrade the map software and then activate the unit?, but which version do I need? And is it also possible to only upgrade the firmware and do the maps later? Thanks I will ask him. Just to be sure, I have a Bang & Olufsen sound system not a Bose. Does this also mean it won't be easy? reading the guide (downloaded from the OP) it seems to me to say you can create your own activator....am I misunderstanding? 2013MY A5 S-line Sportback 2.0 TFSI Quattro S-tronic. Daytona Grey, MMI3G+, 19" Rims. Hey Guys, just want to confirm a few things here.... All the files/maps above are for Europe correct? Yes it's for Europe. NAR firmware you have the latest will check about the map but I think is latest too. dongxiaozuo and X-SoLjA like this. Does your unit have SIM slot (according to the PM's you send me you don't have SIM slot)? Was Audi Connect active before the update? Anyway, it's possible to activate some ONLINE features on unit w/o SIM. Contact ravxvx he has done it on his unit. Last edited by congo; 25th April 2016 at 09:06 AM. Hello Guys..... I would really appreciate some help on this topic. I have an A4 2013 import from Japan. I live in the caribbean and as such the radio frequency bandwidth is different from Japans. I was doing some reading and from what I gathered I believe that if i upgrade/change my firmware the k-box would also update so as to allow me to get radio frequency bandwidth the same as the USA. Can anyone confirm this? I dont think there are maps available for Trinidad and Tobago.... so I dont care too much for the maps. But I would like to listen to the radio. Will the links you guys have in this post work with my car to update the MMI? Hello, sorry for late response. My mmi is without sim. I just updated and i have an error on vcds . Error 03623 invalid security/release. What is this? Would I still be able to update my firmware to these ones in here? You don't need to update the software - you are up to date. Just update the MAP and activate it. Thanks bro, very much appreciated. Does anyone know if this activator will work in a US car? Not sure, the US and EU maps are not the same. I think I can find a US map but not sure about the activation. I will keep looking.